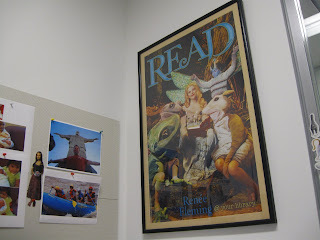 For almost four years, I've been looking at this poster of Renée Fleming on my office wall. My sister sent it to me as a surprise just in time to have Renée autograph after a performance I was attending. 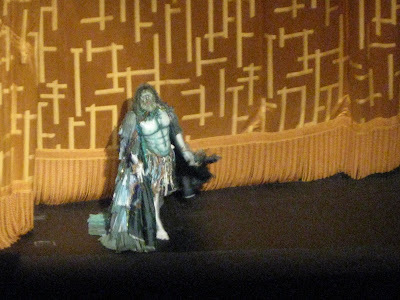 Renée told me that the photo was taken just before curtain of Rusalka on the stage of the Met. So, I've been imagining what it must be like for a while now and I finally had the opportunity to see it last night. Dvorak's score is sumptuous and floated up to the balcony. When Renée sang O Silver Moon, I felt overjoyed, but it had nothing on the final act. The staging was something I had never seen before and I loved it. It actually looked like she walked across the sparkling waters as the moonlit spirit. I think Sally, Noah and I collectively gasped. 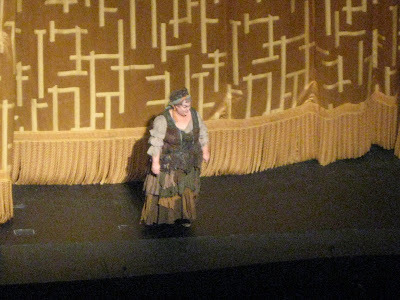 As usual, Renée sang gorgeously. It was great fun to see Stephanie Blithe as the Ježibaba. 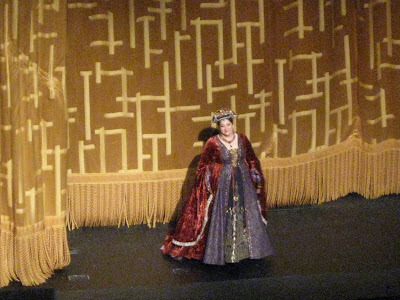 It was also fabulous to see Christine Goerke as the Foreign Princess, since we loved her so much in the WNO's Elektra last season. She's also 7 months pregnant. Wow! As beautiful as it all was, it was also entertaining and quite fun. We couldn't help but delight in all of it, especially the members of the children's chorus dressed as woodland animals helping Ježibaba with her spell. 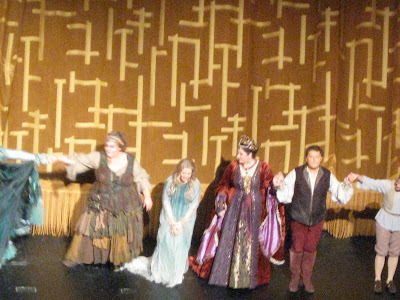 Despite the excitement of finally seeing the production, it wasn't during the opera that I became sentimental - it was after. Noah told Renée that it was my sharing of O Silver Moon with him several years ago that made him want to hear more opera. She looked at me and smiled. I was able to tell her that it was her By Request album, and that song in particular, that saved me during a long and lonely first winter in New York. Her voice brought me comfort and warmth and lead me to a love of opera. 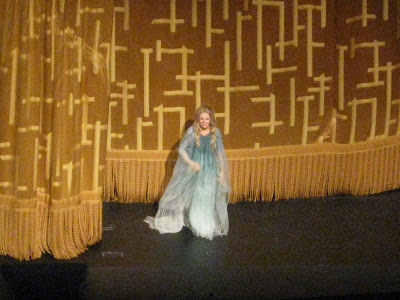 I'm planning to see Rusalka again on the 17th and I just can't wait! You are so immensely blessed to live in NYC! As many times as it seems you have talked to Renee after a performance, she ought to know you by facial recognition by now! And actors on Broadway actually take a bus? 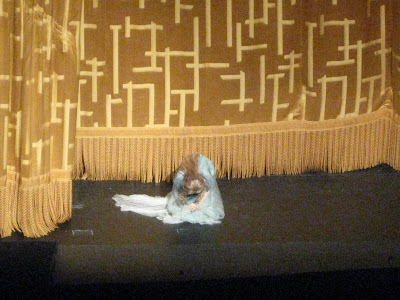 I am glad you enjoyed Rusalka. Your photographs make the costumes look so much better than the Met's promotion photo for this production. Now, I wish this would be transmitted "Live in HD!" Just in case you were wondering, I ADORED the Met's broadcast of "Madama Butterfly" this past weekend. It was definitely one of the greatest performances I have ever heard. I do not really care for the plot very much, but I concede that Patricia Racette IS the definitive Cio Cio San (Renee even said so, or something nearly like that, herself!) of her generation. If I ever go to New York, I shall have to look you up. It appears that you can make a trip truly fascinating for the novice traveller. Wow! It sounds as magical as I've always invisioned it. This is the role I wish to see Renee in at least once before I die. O Silver Moon was the first aria I ever fell in love with, and I owe my whole love of music to Renee. I have planned, on my 18th birthday, to travel to NYC and go see a performance of Renee's at the Met! I've never been to NYC, and I'm afraid I'd get lost! Maybe I could meet up with you, Sarah, and you could give me one of your renowned tours of the city? I'm glad you had a great time at Rusalka! Tyler and Rae-Mae - come on over to NYC. It's kind of hard to get lost if you've done your homework. And sure, if I'm available, I'll fit you in.